Breaking the Fall is a multimedia installation that also functions as a living stage for performance. Diffraction of light passes through a shallow water basin and layers of acrylic mirror to unearth an abstract moving-image cast as a reflection onto the wall. The imagery is of an abstract, nonlinear narrative relating back to Maddie's experience as a resident at Flux Factory. As the moving-image passes through the water and mirror, she physically manipulates the materials to distort the reflection. With multiple pickups placed in the water and onto the acrylic, sounds from the environment are manipulated alongside field recordings to sonically accompany the fractured images. 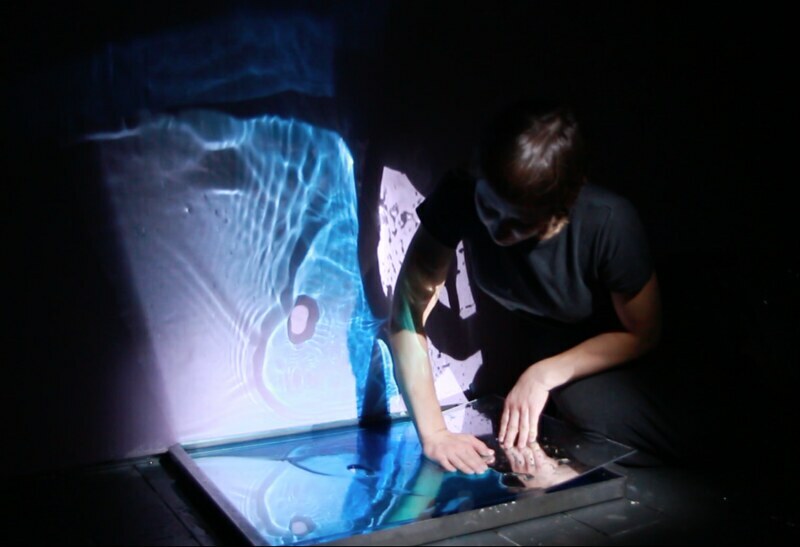 Water installation and performance by Maddie Hewitt. Audio mixing by Dylan Neely. Photograph is courtesy of Matt Hannon. Video is courtesy of Lyoudmila Milanova.